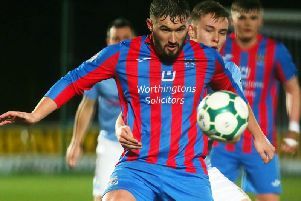 Institute boss Kevin Deery was bitterly disappointed after their score draw with Ballyclare Comrades. Deery felt his side not for the first time this season deserved maximum points and he conceded that he was disappointed for his players. “I’m absolutely gutted for them to be honest, they put so much into it and gave everything and they thoroughly deserved to win the game,” he said. The Stute manager, who did take some positives from the game, also praised Comrades goalkeeper Gregg Shannon. “I’m just disappointed it wasn’t three points instead of one but on a positive note, we really went for it after we conceded and we were very unlucky not to win it in the end,” he added. Deery has always ear marked October for Institute to try and get a bit of momentum as they were facing sides who are in and around them in the table and he was also pleased that Gareth Brown opened his goal scoring account. “We’re really targeting these five games and trying to take as many points as possible,” he said. “But earlier in the season we might have dropped our heads and got nothing out of the game but we were excellent this time, in the second half especially. “It was a great finish and it just sheer euphoria from Gareth because of the amount of work he’s putting in. It was a relief for him because he’s giving everything and that showed in his celebration.